DOWN Arts Centre is proud to have hosted a number of bands that are guaranteed to raise the roof and deliver a truly memorable night of live music; none more so than THE ILLEGALS and Niamh Kavanagh who will be performing their new show, A Common Thread, at DAC on Saturday 30 November at 8pm. The Illegals with Niamh Kavanagh at the Down Arts Centre this Saturday evening. 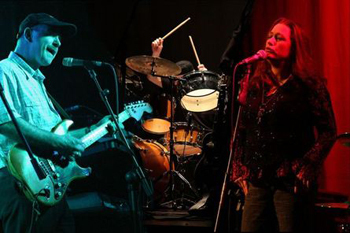 A Common Thread sees Niamh and the band at their very best, belting out a superb set of foot-stomping hits from Fleetwood Mac and the Eagles – and others from the West Coast sound. The Illegals have taken their sell-out show to theatres all over Ireland and love nothing better than coming back to their favourite venues with a little something different every time, built on the back of those solid memorable songs from the Big Two, highlighting the extraordinary effect these two great bands have had on the music of the last 40 years. To purchase tickets (The Illegals, £15 / £12.) and for further information on any Down Arts Centre events, please contact the box office on 028 4461 0747.